Moving into a new week I was looking through my hard drive and realize I still have quite a few warm weather looks to share with you before I go full fall sweater weather over here. It’s still been in the high 70’s here and feels like Summer during the day and then at night we get that cool fall brisk breeze. I count my blessings being able to enjoy this weather in October. For some of the transitional days, a great way for me to blend into fall trends is to grab a vest. 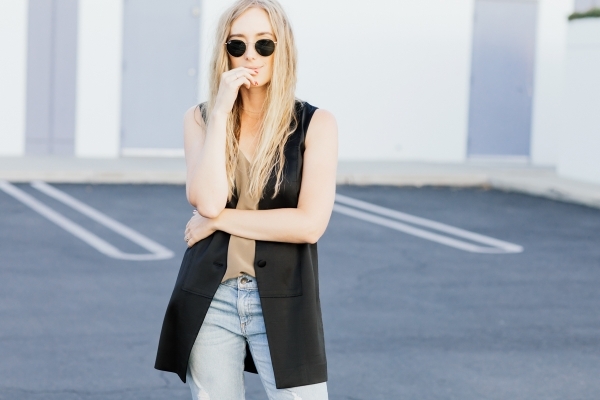 Love how this silk tuxedo vest dresses up my distressed denim look. Business on top, party on the bottom? HAHAHA. 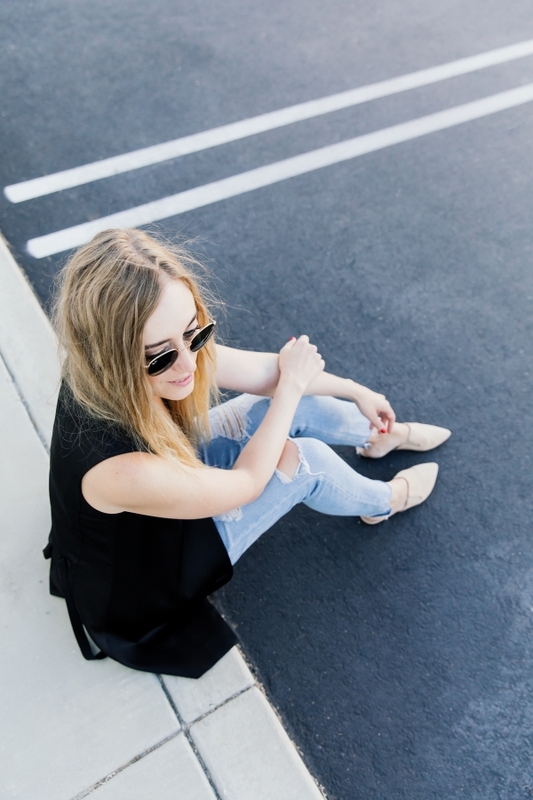 You know I am all about those Cali cool vibes. Denim always does it for me. On the IVF front, I can let you know that my body feels like it’s going to EXPLODE with my growing eggs inside me. I am beyond uncomfortable but I know that each moment of discomfort and each side effect is just evidence that I am growing precious eggs inside me. We are getting VERY close to my egg retrieval and should have a schedule any day of when I will go in for surgery. I can not wait to get this portion of IVF behind me. One day at a time and we will get to the finish line soon enough. In the meantime, I have been hiding out at home in gym clothes for most of the days. Nothing much fits me and the headaches and exhaustion are real. Will continue to update you guys on instagram stories on how I am feeling day to day. I have to continue to thank you all for your immensely kind support. Also! Thank you to everyone who joins Blake and I make pizza on instagram live on Saturday night!! I can’t believe I finally got Blake to do a LIVE with me. If you missed it, don’t worry. I think I can convince him to do another dinner live with me soon. Also! HAPPY BIRTHDAY to my sister!!!!!! It was her actual birthday yesterday but little shoutout because I love her to pieces!!! Rena - Like the edgy touch of this stylish combo! Natali - Minimalistic and super cool combo! Charmaine Ng | Architecture & Lifestyle Blog - I love how sleek the vest looks. Need one for myself ASAP! Sharon - I can never pull off a vest but you do it so well. I’m really liking your jeans, lately I have been living in jeans. Here in Pennsylvania it was 90 degrees a couple days ago and then yesterday morning in was 45!!! It’s weird. I’m praying for you during the IVF process, stay strong. Rachel - I love all the trends you put together! You look amazing!